A village church near Sleaford will be swapping hymns for pop and rock hits when two musical ministers perform a concert this weekend. St Andrew’s Church, in Heckington, plays host to The Rocking Revs on Saturday. 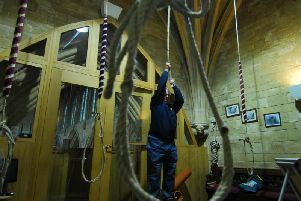 The duo comprise Heckington’s rector, the Rev Chris Harrington, and the Rev Dave Maylor, vicar at Barnack near Stamford. The pair played together at Christmas at Heckington Village Hall, raising almost £1,000 for three charities. This time, proceeds will go to St Andrew’s Church. Ahead of The Rocking Revs, there will be a performance by local band Los Trios. The Rocking Revs will be joined by harmonica player Dougie. The evening will feature well-known songs by Rod Stewart, Van Morrision, The Eagles and The Beatles. The concert takes place at 7.30pm. Tickets, priced at £7.50 (including a buffet supper), are available from 01529 460272.